The Miracle League of the Triangle, in association with the Durham Bulls and Capitol Broadcasting Company, are expanding their services to Downtown Durham. A new Miracle League facility has plans to open in 2018 at 461 Morehead Ave., across the street from Durham Bulls Athletic Park. As part of the partnership, the Durham Bulls and Capitol Broadcasting are kicking off the fundraising with a $400,000 matching grant. "The Miracle League is an incredibly important, impactful organization that brings the joy of baseball to so many," Durham Bulls General Manager Mike Birling said. "We are honored to continue our partnership with The Miracle League, and to bring a facility to the doorstep of Durham Bulls Athletic Park. We look forward to doing all we can to help this tremendous program continue to grow in the Triangle." The Miracle League program and field are specifically designed to serve children and adults with special needs through the game of baseball. The program removes the barriers that keep children and adults with mental and physical disabilities off the baseball field, and lets them experience the joy of America's favorite pastime. Since the main barriers for these players arise from natural grass fields, Miracle League teams play on a custom-designed, rubberized turf field that accommodates wheelchairs and other assertive devices. 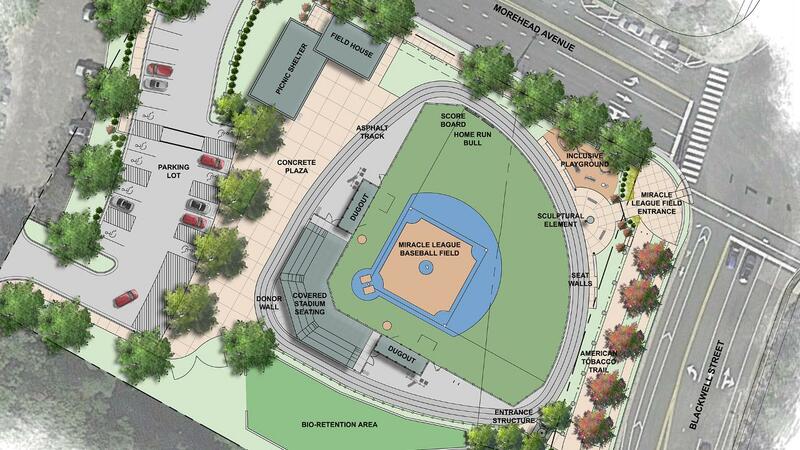 Upon completion, the new facility in Durham will be the third location for The Miracle League of the Triangle, joining locations in Cary and North Raleigh. Construction is scheduled to begin on the site in late 2017.